We are the most wonderful and incredible industry manufacturer, supplier and wholesaler of Designer Kurtis. The products are manufactured with optimum softness, aesthetic appeal, easy to wash, colour fastness and reliable stitching. 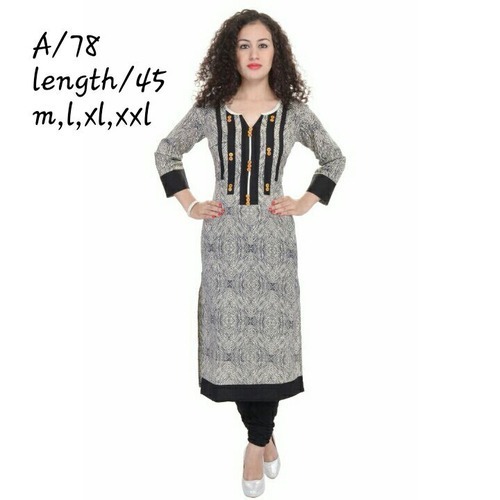 We cotton village offering a different collection of designer Kurtis. Our company offered a different ranges of Kurtis are manufacturer, wholesaler and supplier by our experts using good quality materials and threads that are obtained from the unfailing hawkers of the market. Offered ranges of Kurtis is perfect for a long day purpose as these are very skin-friendly and comfortable to wear.